Are you the kind of person who drags a chair in from the kitchen to serve as your bedside table? Or the kind of person who buys a matching set of bedside tables to go on either side of the bed? If the former, well, it's not the worst thing in the world, but it might be worth considering an investment in something slightly more grown-up. Chair or carefully chosen matching set, we all need something beside our beds to put our books, tablets, glasses of water, eye-masks, and whatever else on. If you have a tendency to accumulate lots of clutter on your bedside table, it's worth considering buying one with an inbuilt drawer; if you have the enviable quality of neatness, something plainer and lighter will do just fine. And if you're stumped as to where to start, we've chosen a selection from our collection here at homify to help give you some inspiration. Take a look below! 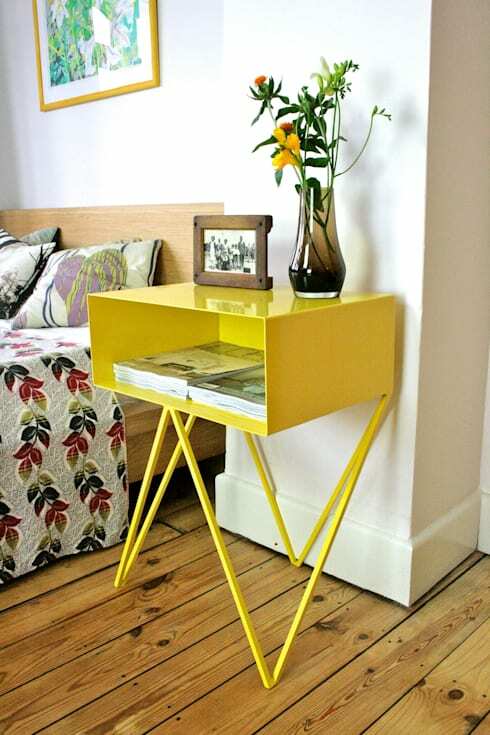 The Robot side table by &New is available in a clutch of different colours, but we love this canary yellow one. We also love the angular lines of the legs, and the smooth sheen of its top. Stow magazines and books in the open hatch, clearing a space for pictures, flowers or a lamp on top. Sure to bring a burst of sunshine to any bedroom. 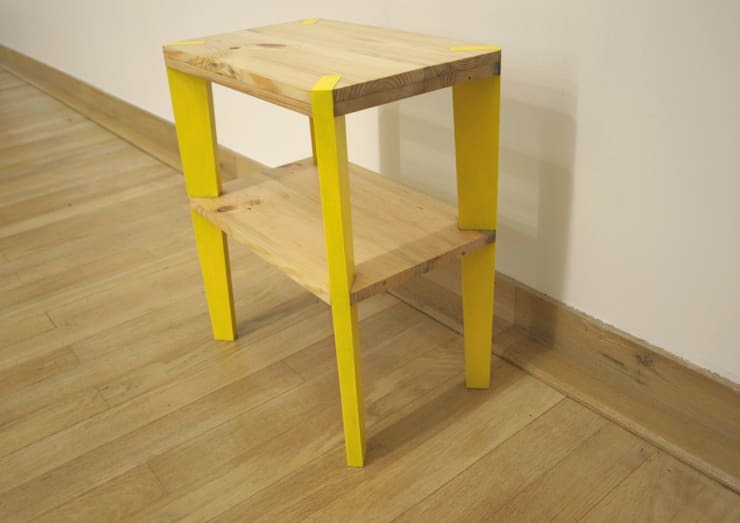 Another yellow bedside table, this one by Allan George. Less futuristic in design than the Robot table, its clean, minimal lines are nicely offset by the brightly coloured legs. 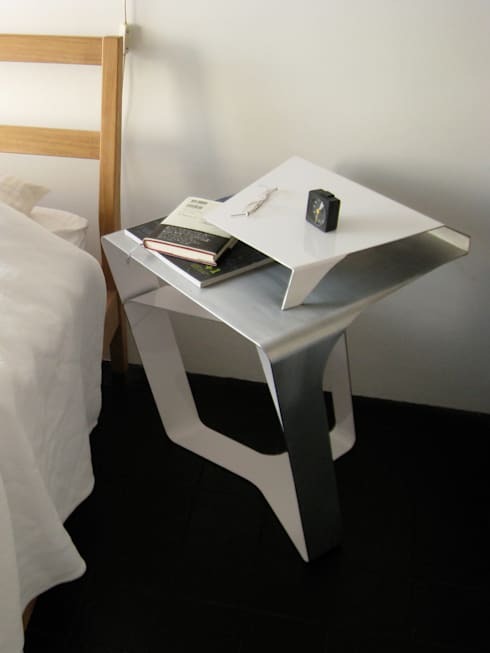 The Quac side-table by Tonucci Design sits on castors, so, depending on the depth of your bed, you could pull it in to serve as a breakfast tray. With its scooter-shape, it could be placed horizontally or vertically beside your bed, depending on the space you have. 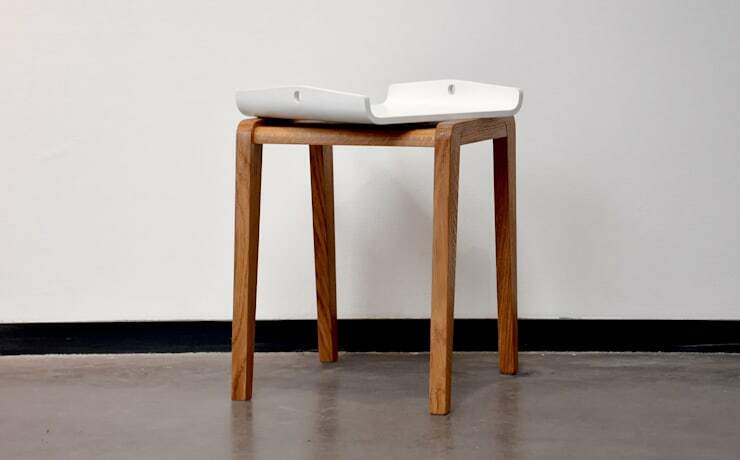 This C table by BONBA studio is both practical and beautiful. 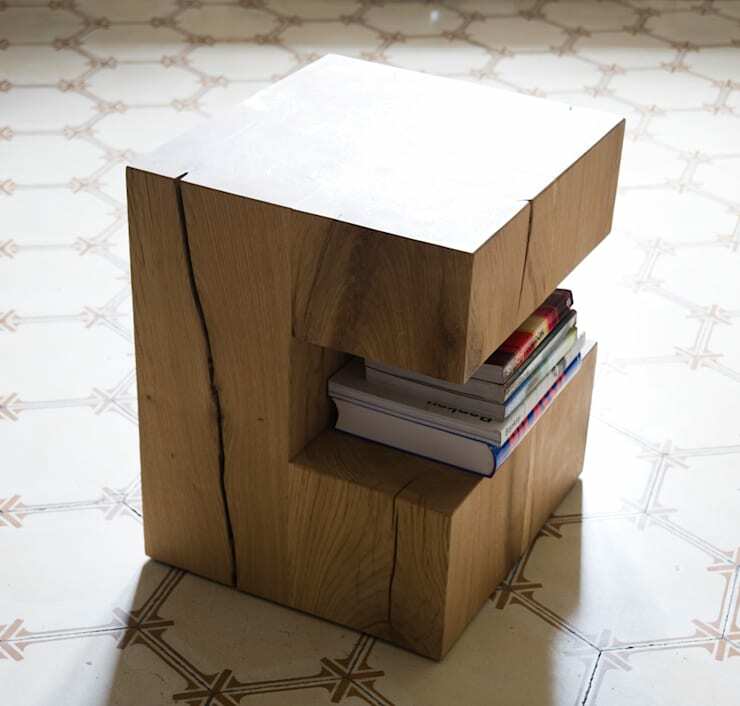 Carved from a single block of wood, it has a shapely modern design, and the re-imagined 'drawer' cut out of it would be immensely practical for all sorts of bits, pieces, and books. It has a reassuring solidity that's very charming. Want to imagine you've fallen asleep, and woken up some time in the future? 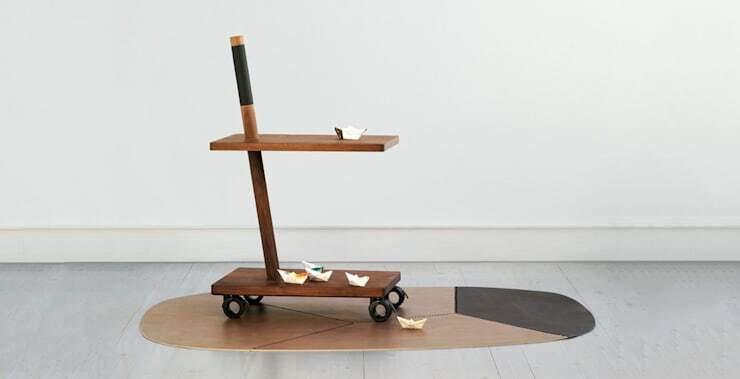 The Plane table by Oyadica could just make you think that you have. Its sleek futuristic structure is given an added dimension with a brushed chrome and white plastic top. Hide unused bits and pieces under the raised platform, and save space on the platform itself for mementoes from Space Command. As we said above, chairs used as bedside tables aren't the worst thing in the world—and Covo would seem to agree! This quirky re-imagining of the student staple offers added functionality as a place to hang belts, scarves, skirts or trousers, while the seat allows plenty of room for books, glasses and other night-time essentials. Whoever said the chair nightstand couldn't be stylish?! Part bedside table, part chest of drawers, all gorgeous, we love this piece from Galleria Gaia. 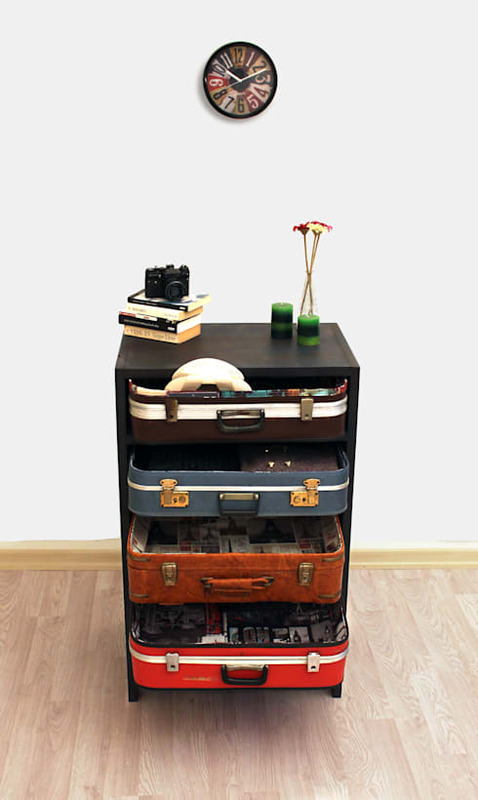 Loads of storage room, and a clever repurposing of old suitcases: what's not to love? 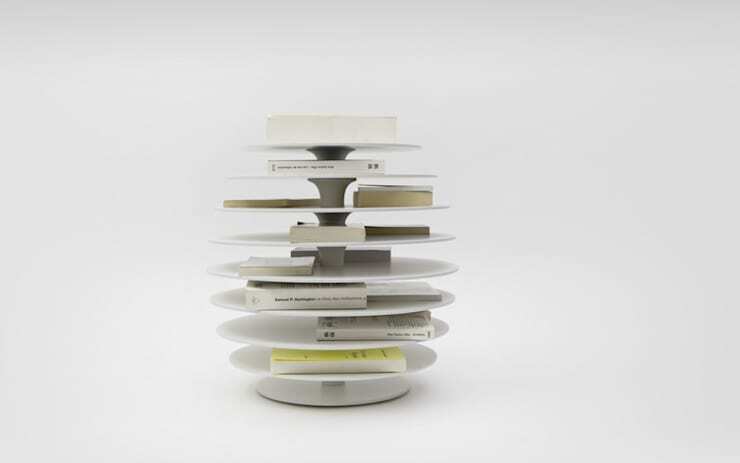 If you love to read, and find your bedside table is constantly overflowing with books both read and unread, Ruches by Polit could be the answer to your woes. Like a mini-library shelf, it will hold enough books that the top should rarely end up with a precariously balanced stack on top. Are you a chair person or a matched pair kind of person? How important is a nice nightstand to you? Let us know in the comments!